In baseball, as in a lot of various other religions, three is a special number. Three strikes. Three outs. Three times three innings. A three-game series. Even the season of 162 games can be evenly divided by three. The first icon of the game, Babe Ruth, wore 3. Three is big and you’d expect that the Cardinals, with all their history, would have a good bit of talent to choose from at this number. That’s tough to stomach. No wonder that the number kept moving, because nobody was good enough to get a return visit to the Cards. It took Carlos Beltran to stop that wheel from spinning, at least for a while. So I wasn’t really sure which way to go with this number when I originally planned for it. Renteria was my first option, because until Jhonny Peralta, he was the last offensive threat the Cardinals had had at shortstop. I was always a fan of Renteria and I figured he’d get the picture up top until I went through the list again and a name jumped out at me. 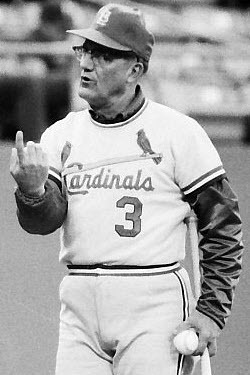 What we know today as “The Cardinal Way” has almost everything to do with the way Kissell taught throughout the Cardinal organization throughout his career. Kissell was signed by Branch Rickey and stayed wearing the red until his passing in 2008. If it hadn’t been for the car wreck that claimed him, he’s have spent 70 years in the Cardinal system in one capacity or another. 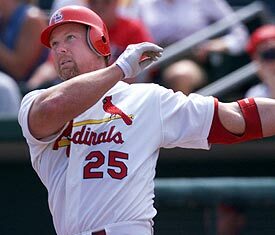 Name a Cardinal star up to and including Albert Pujols and most likely Kissell worked with them on some facet of the game. Imagine loving the game that much. Imagine still getting out there at 80+ to teach youngsters that will never learn as much as you’ve forgotten, all to help a team win. We’ve seen that a few times–tomorrow’s number will be another one–but it only enhances the culture of loyalty and respect that St. Louis is known for and is striving for. It’s an amazing legacy that all fans should respect (and all that know about it do). For a man that never made it to the majors–never got higher than the now non-existent Class B level–he’s become a legend the likes of which we’ll likely never see again.